So, what do caravan clubs do? Our particular club usually meets four times a year for a muster. Sometimes we may have a quick catch up at a local pub for lunch in between musters. Having plenty in common there’s always plenty to talk about. Members aren’t expected to attend every muster as being keen travellers there are always a few vans away on the road or someone travelling overseas. Where are the musters held? At caravan parks and for our group they are mostly in Victoria. Our group is growing in size so the facilities that we look for at caravan parks must be large enough for us to socialise out of the elements if the weather turns nasty. And musters, what do they entail? Sometimes we organise activities in advance at other times we just arrive at the town and go with the feel of the place. Often people throw out a few ideas on the club Facebook site for a free camp on the way to the muster which breaks up the length of the journey and adds to the fun. The actual muster technically runs from Friday through to Sunday but only if people have other commitments do they stay for that short a time. Personally we usually allow at least a week to be away and more if we have no other plans. And when you are there? Well there are a lot of chats over coffee, beer and wine about where we’ve been and where we are off to next. Things are very laid back and relaxed. If you just want to curl up with a good book, well so be it. We walk the local town, tour the area and visit the local attractions. We recently visited the Rutherglen wine growing region of Victoria and of course we had to do a ‘winery walkabout’ which probably should have been called a stagger. If there is a good pub nearby we’ll organise a lunch or dinner. We’re not adverse to visiting churches, cathedrals, gardens and bakeries too. Of course we ladies have to throw in a bit of shopping for homewares and clothes to fill in time while the fellas sample the local brews. So as not to appear unfit we have regular bocce and Klop (Finska) tournaments and for those who enjoy cards, well there is always a card game to be had of an evening. For a bit of fun we may have a themed cooking night. At Rutherglen we had an Italian dinner under the stars. The weather was warm and balmy and beside the lake under tall gums we produced a long table of delicious food all prepared in our own vans. There are Tag Alongs where a group may organise a tour to an interesting area. But more often than not a few people may team up to do their longer winter trip to the north or west in convoy. We keep in touch via Facebook and email and it is not unusual for people to meet up when passing each other in far away places. Contact a group and ask them if you can come along to a muster. You are under no obligation to join and you just may have a whale of a time. Sounds like fun. Something to look into down the track for us maybe. You have to be the most organized folks I’ve ever come across in this world with your musters. My hat is off to you and all of your planning committees. When I first looked at the picture. I thought it was an old-fashioned Tent Revival without the tent. Just a muster committee who meet once a year and select the 4 parks for next year and the events team who organise games & fundraising. Our motto is ‘the club with no rules’ and we do our best to keep it simple. But I must explain further. We have a big white board & everyone writes ideas on it e.g lunch at Royal hotel Friday and those who are interested join in. It works very well. 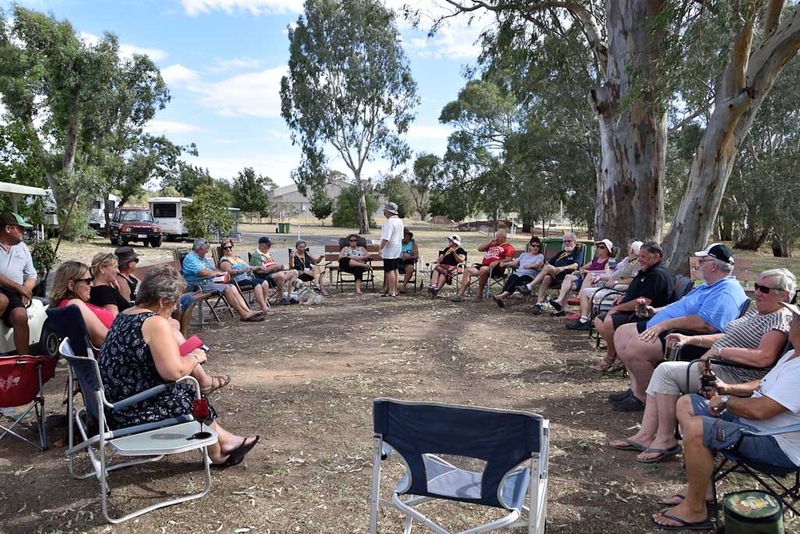 Caravan Clubs can be fun – we belong to the Rotary RV group – they have about 7 chapter’s Australia wide and we do musters and tag-alongs, usually visit local Rotary Clubs, or they visit us in the park. We also occasionally get involved in local Rotary supported projects like Blaze Aid. While this is very social and fun, as every Rotarian comes from a different location and has different work backgrounds and different tatses in wine, we find travelling alone good as we geocache, waymark and munzee – these take some time and are not everyone’s cup of tea – but they have taken us to the most unusual locations. Now that us interesting I wasn’t aware of Rotary RV clubs. It makes x lot of sense.